An original journey through the Mysteries of life expressing a global range of musical influences from indigenous to jazz. 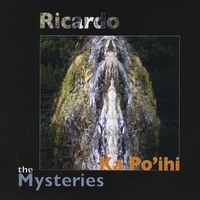 Ricardo as a writer has created an eclectic group of original songs here, ranging from a Yoruba chant to a samba, passing through the heart of jazz along the way. "Ka Po'ihi" is an old Hawaiian word that refers to those particular Mysteries that can never be explained. The first reviewer of the music wrote "uniquely evocative, inspirational and quite brilliant." The music is brought to life by the wonderful musicians (and engineers) who made this recording, both in Hawaii — Slyde Hyde (the Wrecking Crew), Peter Weinstock, Luke Clebsch and Aja…and in Seattle — Orville Johnson, Garey Shelton, Julian Smedley, Nova Devonie, Linda Waterfall, Carson Michaels, Casey McGill et. al., Jeff Busch, Brooke Lizotte and Ross Nyberg.